The Missing Chancleta and Other Top-Secret Cases by Alidis Vicente. Review: In a world, where an eight-year-old detective has cases to solve... and assassins to findÉ she does what she can to solveÉ theseÉ cases. The Missing Chancleta AND OTHER TOP-SECRET CASES By Alidis Vicente is a book that is about an 8-year-old girl, named Flaca that is a detective and loves to solve cases. In The Missing Chancleta AND OTHER TOP-SECRET CASES you get to know three epic mysteries being solved byÉ DETECTIVE FLACA! You don't get to decide who did the crime, but its fun to see WHOÉ WASÉ THEÉ CULPRET? She does the work in a fun way for kids to have fun while they read. The Missing Chancleta AND OTHER TOP-SECRET CASES is good for kids 8 and up. You read better in Spanish? Hmmmmm, I hear this book is Spanish and English. This book would be interesting for kids that are interested in detective books. It is an amazing book that should be great for a kid that also wants a smile on their face. We would like to thank Pinata Books for providing a copy of The Missing Chancleta and Other Top-Secret Cases for this review. 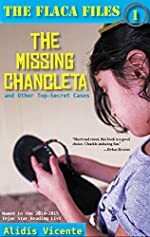 Have you read The Missing Chancleta and Other Top-Secret Cases? How would you rate it?